Heat oven to 375°. Mix shortening, sugar, egg, and flavorings thoroughly. Measure flour by sifting. Mix flour and salt; stir into shortening mixture. Divide dough in half. Blend food coloring into one half. Roll a 4″strip (using 1tsp. dough) from each color. For smooth, even strips, roll them back and forth on lightly floured board. Place strips side by side, press lightly together and twist like rope. 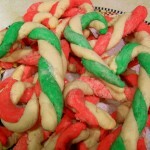 For best results, complete cookies one at a time-if all the dough of one color is shaped first, strips become too dry to twist. Place on ungreased baking sheet. Curve top down to form handle of cane. browned. While still warm, remove from baking sheet with spatula and sprinkle with mixture of candy and sugar. Makes about 4 doz. Canes. Note: If you use Gold Medal Self-Rising Flour, omit salt.